You are here: Home » 2010 Hot Rod Power Tour » The 2010 Hot Rod Power Tour – Muscle Car Heaven! 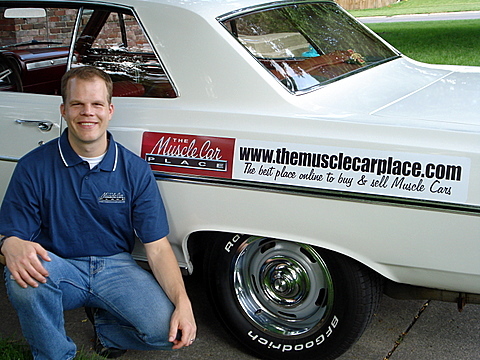 The 2010 Hot Rod Power Tour – Muscle Car Heaven! Summer is here, and so is the 2010 Hot Rod Power Tour! Look for this cool looking car and this goofy looking guy on the tour. If you’re a fan of American muscle, or even just cool cars, the Hot Rod Power Tour is like heaven on wheels. For one week hot rodders everywhere gather together and take a cross-country road trip. We’ll be on the trip again, and you can follow us each day on our website blog – with pictures and video! We did the event last year and were amazed at the cars. We saw completely unrestored 1967 GT350’s sitting next to 6-figure pro-touring Camaro’s, Dodge station wagons with big blocks and 4-speeds, some stuff that didn’t look anywhere close to being street legal (but did have license plates), and the like. It’s absolute car heaven! The trip starts Saturday June 5th at the Iowa Speedway in Newton, IA and ends June 12th in Mobile, AL. Each day we’ll drive a few hundred miles to the next stop, set up shop, doing a little racing, do some cruising, and then do it all over again the next day. Here is the list of cities and dates where we’ll be – and spectators can attend FOR FREE! Follow us on the trip! We’ll be updating our blog with pictures and video each day as time allows!